WIAA Handbook rule 20.3.1.E. mandates that "hands-on" stunt certification is required for dance/drill coaches who intend to have their dance/drill squad perform stunts. The certification program must be approved by the WIAA. Coaches must be recertified every three (3) years. Stunt Certification Clinics will be offered at various locations throughout the year, so check back periodically. The clinic fee is $65 and registration is open to anyone in need of the certification. On-site payment by CHECK ONLY is accepted. *A minimum of six (6) coaches must be registered for each certificaiton course in order for the clinic to be held. Manage your MyWIAA profile, upload team photos, complete online rules clinics, and more. 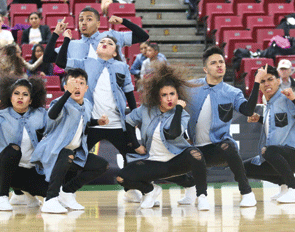 State Dance/Drill information: schedule, performance order, results and more.